A world renowned music artist oozing with talent, a pop culture icon, a supreme example of flamboyance and stardom, a troubled soul. In the wake of his death, Michael Jackson was many things to many people and no matter what you may think of him, he left behind many creative works of art – one of those being the Captain EO 3-D experience. Captain EO, a 3-D adventure starring Michael Jackson and directed by Francis Ford Coppola as well as executive-produced by George Lucas, opened in Disneyland’s Magical Eye Theater situated in Tomorrowland in September of 1986. Most guests reacted favorably to Captain EO. However, over years the crowds disappeared. After a run of over ten years at Disneyland, Captain EO closed quietly in April 1997. It was replaced with “Honey, I Shrunk the Audience” in May 1998. The final place at which you could see Captain EO was at CinéMagique, presented by Kodak, in Discoveryland at Disneyland Paris. In late summer 1998, the Captain departed from Paris as well. While Captain EO attendance had dwindled over the years (a very important factor in keeping Disney attractions open) I have to imagine that the Michael Jackson’s sexual abuse scandal of 1993 had some affect on the whole scenario. The movie itself tells the story of Captain EO and his ragtag crew who are on a mission to deliver a gift to a wicked alien queen, the Supreme Leader, on her world of rotting, twisted metal and steaming vents. 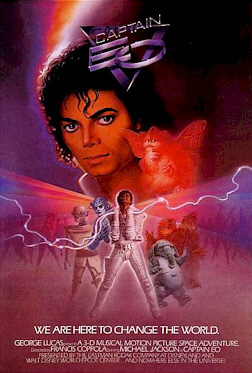 Captain EO’s alien crew consists of his small flying sidekick Fuzzball, the double-headed navigator and pilot Idee and Odee, robotic security officer Major Domo, a small robot Minor Domo (who fits like a module into Major Domo), and the clumsy elephant-like shipmate Hooter (Tony Cox) who always manages to blunder the crew’s missions. Upon arriving on the planet, the crew is captured and sentenced to enhanced interrogation. Before being sent away, EO tells the Queen that he sees the beauty hidden within her, and that he brings her the key to unlock it – his song, “We Are Here To Change The World”. The two robot members of the crew transform into music instruments and the crew members begin to play the various instruments. As Hooter runs toward his instrument, he trips over EO’s cape and breaks his instrument, stopping the music. The spell broken, the Queen orders her guards to capture Captain EO and his crew. Hooter manages to repair his instrument and sends out a blast of music, providing EO with the power to throw off the guards. He uses his power to transform the dark hulking guards into agile dancers who fall into step behind him for a dance number. As EO presses forward toward the Supreme Leader she unleashes her Whip Warriors, two cybernetic defenders each with a whip and shield that can deflect EO’s power. A celebration breaks out to “Another Part of Me”, as EO and his crew triumphantly exit and fly off into space. Captain EO made full use of its 3-D effects. The action on the screen extended into the audience, including lasers, laser impacts, smoke effects, and starfields that filled the theater. These effects resulted in the seventeen-minute film costing an estimated $30 million dollars to produce. At the time it was the most expensive film ever produced on a per-minute basis. I remember visiting this attraction once in 1983 or 1984 I believe, during my second visit to Disneyland. And while never a Michael Jackson fan myself, I did appreciate the 3-D movie experience. So, as we say goodbye to the “king of pop” I say thank you Michael for contributing to a piece of Disney history. Here is the film in it’s entirety broken down into two segments.